"We need also to learn in Europe to do things much faster and much lower cost," EC Commissioner Elżbieta Bieńkowska said in Brussels Jan. 22. Credit: European Commission webcast. WASHINGTON — The European Commission is preparing a series of programs aimed at fostering space startups and encouraging them to stay in Europe rather than leaving for the United States. The absence of an effective policy for the European Commission to be first to buy products and services from startups further isolates European “NewSpace” companies from their American counterparts, the commissioners said. Elżbieta Bieńkowska, a commissioner who oversees industry and entrepreneurship at the European Commission, said a study conducted with the European Investment Bank confirmed what was already believed — that European investors still view space companies as too risky, despite the success many have attracting capital overseas. A joint program with the European Space Agency devoting 100 million euros for in-orbit validation and technology demonstrations. The European Commission’s European Low Cost Space Launch competition — first announced in June — that will award 10 million euros to a small launcher company in 2021. Maroš Šefčovič, vice president of the European Commission in charge of energy union, praised Bieńkowska’s work, emphasizing the need for additional measures to stem Europe’s brain drain to the U.S. Visiting space startups in the U.S. always results in a “double feeling,” he said. Šefčovič said European investors need to be more comfortable with the longer timescales and the larger capital expenditure requirements of space startups compared to other industries. Šefčovič said the European Commission is working on a pilot program for space equity and ways to create more research and development funding for space startups. He cautioned, however, that money isn’t the only resource space startups need. “When I am talking to young startups, it is very often they tell me ‘we do not need your grant … we need our first contract,’” he said. In those discussions, startups often say having the European Commission as a customer would demonstrate demand that they can parlay into private funding, Šefčovič said. “We will definitely need to progress on innovative procurement,” he said. 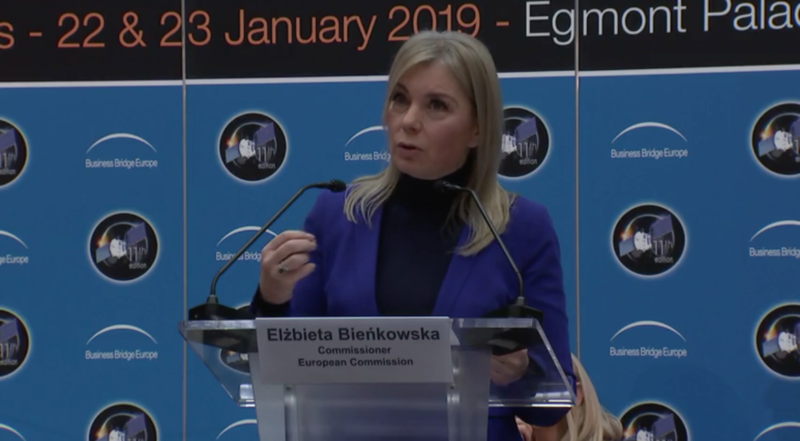 Bieńkowska said another option the European Commission can explore is buying launch vehicle capacity — presumably from a European launch provider — and giving it to startups so they can demonstrate their technology in orbit.